This Week In Race: Pepsi Challenged; Appropriation Nation; Black Twitter Explained : Code Switch California's Senate votes to limit the cooperation police can give immigration authorities, while research shows fear of deportation can make people sick. And Pepsi's unity message backfires. 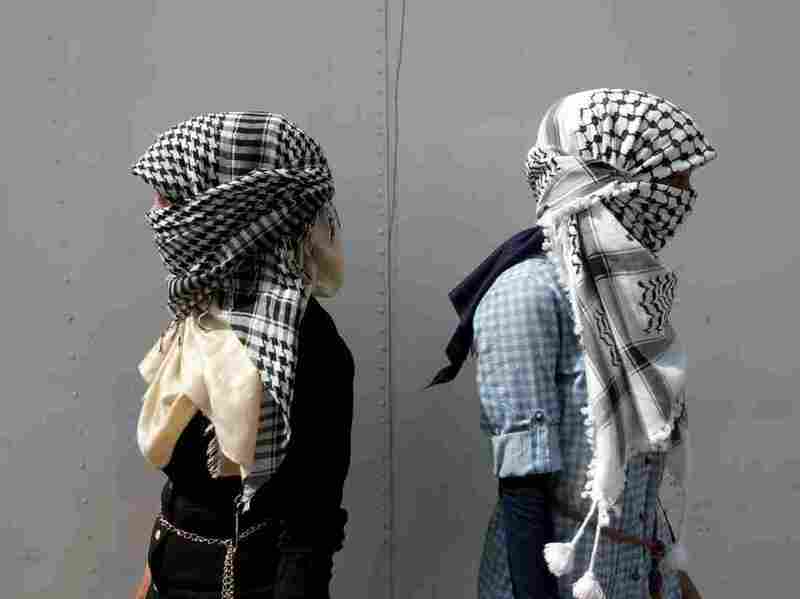 Black-and-white keffiyeh like the one pictured above have long been associated with Yasser Arafat and the Palestinian resistance. This week, fast-fashion Brit emporium Top Shop used similar fabric for a "scarf playsuit." Last week, we told you about how many of the country's police chiefs believed ICE crackdowns would make their jobs harder and hurt public safety. This week California took it a step further: the state Senate passed Bill 54, which limits the cooperation state and local police can give to immigration authorities. The bill, which has unofficially been labeled a "sanctuary state" bill, is expected to easily pass in the Democratic majority State Assembly, and Gov. Jerry Brown, also a Democrat, is expected to sign it. And there's this: ICE is sending shivers through many immigrant communities, which may have serious implications for public health: Fear of deportation can make people sick (constant anxiety can have an ill effect on existing medical conditions) and can also lead people here illegally to skip or delay trips to the doctor. Which makes any small illnesses major, and heightens the possibility of communicable diseases, such as tuberculosis, spreading more widely. Then there's the hot fast-fashion Brit emporium Top Shop, which apparently thought it was a good idea to use the black-and-white keffiyeh (long associated with Yasser Arafat and the Palestinian resistance) as the fabric for a decidedly unmodest (sleeveless, skimpy back, short-shorts) "scarf playsuit." Really. AJ+ has this brief explainer. Top Shop also said it meant "no offence." Speaking of explainers: The next time someone asks "What's Black Twitter, and where do I find it, anyway?" just cue this up on your phone and hand it to them. Life just became so much simpler. The Tampa Bay Times did an extraordinary job of looking into how race factored into people using Florida's Stand Your Ground laws in 2013. Now they're back with a look at how race affects police shootings. Specifically how being black affects police shootings. Not a fun read, but an essential one. A few pieces of happy news: Nick, Zach, Aaron and Nigel Wade, Ohio quadruplets, decided to mention they're multiple-birth babies as they applied to college. Each also wrote about the effect being a quad has had on their lives — different lives, different effects. ("We were four boys who shared one face," one wrote in his essay.) They applied as a group, hoping their unique situation would get them a generous financial aid package. Now Harvard and Yale are fighting to see who gets to give them money and a place in the Class of 2021. And several other highly selective colleges are interested in each brother. We'll watch to see who goes where. There's benefit in being a blerd. For proof, listen to this week's podcast, where our very own blerd extraordinaire, Gene, and guest host Glen Weldon, from BPR's Pop Culture Happy Hour, talk to black comic creatives about bringing some much-needed inclusion to the genre. Beyoncé's not the only golden girl. Not since the U.S. Gold Bureau made the decision to strike a new gold coin to commemorate the 225th anniversary of the United States Mint. Lady Liberty is depicted as a black woman, with natural hair in pinned-up twists. This is the first time Liberty has been depicted on U.S. currency as anything other than a white woman. Future coins will show her as Hispanic, Asian and Native American "to reflect the cultural diversity of the United States," according to the mint. Face value of the gold coin? $100. A black face on the money? Priceless! Thing that gave us hope this week: A little girl knew her own mind, thank you very much, and chose the doll that was most like her, regardless of skin color. You go, Sophia! That's it for us. Now you go off and make some wise choices. We'll be back next week.